Structural Design | Technology | FUJICOPIAN CO., LTD. Stable application of thin film from cassette can only be achieved with no slight changes in frictional properties and no variances in tension. For example, to allow for correction tape to be used smoothly without stress, high technology is ubiquitous in places that cannot be seen directly with the eyes. 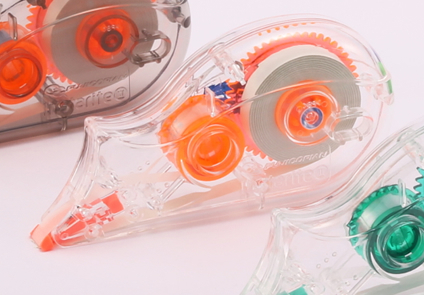 Fujicopian's high-precision design ability owing to its thorough knowledge of coating liquid and films allows for the realization of stable application of thin film for small correction tape cassettes. From the containers that hold the film up to the outer colouring materials, we look for designs that are in line with current market needs. Who are the people who will use the product? Under what conditions will they be using it? We perform product planning by overlapping investigation from all angles.